Race 3 of the 2014 Gravesend Floodlit Winter Series of races took place on 11 December at the Cyclopark. This time I entered on the night and paid the special SLGR entry fee of £5. There were, as always, two races taking place. 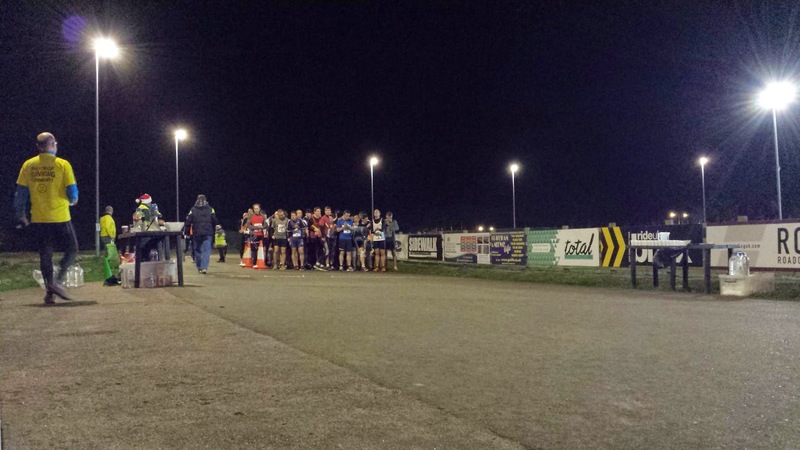 The 5k at 7pm and the much more popular 10k at 7.30pm. It's that time of year where the clothing choice gets tricky and I had arrived with a few options. For the bottom half I had either just shorts or running tights with the shorts on top, and for the top half I knew that I wanted to wear my club vest so it was a case of deciding whether to go for a base layer or tech-t-shirt and arm warmers combo. I also had gloves and a hat in my bag just in case. I headed out with my SLGR team mate Adam for a warm up and to test how the conditions felt whilst running. The temperature was around 7 degrees but stormy conditions were forecast for the night and the wind had picked up significantly. After a few minutes of jogging, it was clear that the tights were not going to be required and I decided to go with the tech-t-shirt and arm warmers combo up top - this proved to be the perfect decision, unlike a few days earlier at the Alan Green Memorial 10 mile race where I got it horribly wrong! So, although it was the third race of the series, it was only my second as I had missed the first. 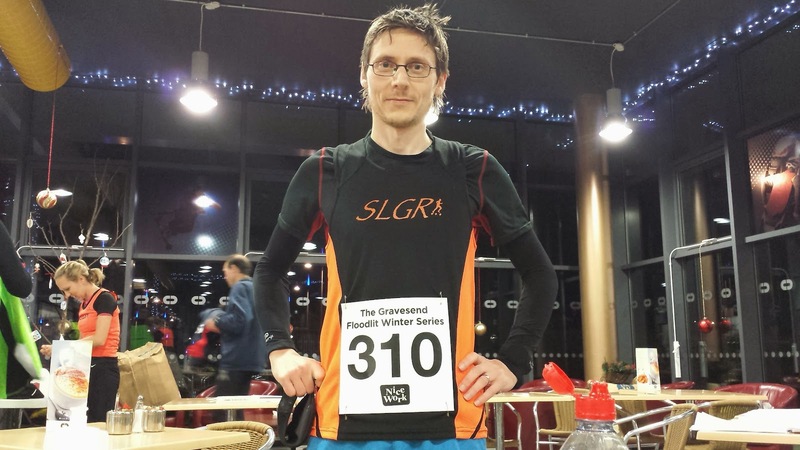 Anyone that read my post about the Gravesend Floodlit Series 10k November 2014 Race would know that I finished in one of those times that really annoys most runners - bang on 40 minutes. Just one second quicker would have made a massive difference. So with that in mind, I had unfinished business to resolve. The goal of the evening was to run a sub-40 10k on the Cyclopark track. So when the race director, Martin Burke of Nice Work, started the race, I headed off down the opening downhill section at a strong pace. I'm really enjoying running 10k at this venue - the four lap course feels quite neat in my head and I love breaking it down into the four quarters. With a goal to maintain a sub-10 minute per 2.5km lap pace, which also gives me another very neat sub-4-minute per kilometre target. Lap 1 - The course was pitch black in places and it took a while to feel confident running into the darkness. I ran it at quite a strong pace, and as the lap progressed, those that started way too hard began to fall back. Things started to feel a little more settled as I came back towards the race hq at the end of the lap. I had a Medway Tri runner (P6) a few metres in front of me and quite a way on front of him was an Istead and Ifield runner (P5). Lap 2 - I started to gain on the Medway Tri runner and eventually drew level. On the downhills he would shoot off about 10 metres in front of me and on the uphills I would claw back the difference. This continued throughout the whole of this lap. It's worth noting that it was pretty windy in some parts of the course. By the time we reached the 5k point we were neck and neck. Lap 3 - As usual, the Medway Tri runner opened up a gap on the opening downhill at the beginning of lap 3, but I stuck with what I know best and as we turned the next corner to begin heading up the incline, I nudged in front and started to edge away. Although he remained close behind me for quite a while, I never did see him again. Towards the end of the lap, the Istead and Ifield runner who had been a significant distance ahead earlier on was now right in front of me and I moved past him just before the end of the lap and slotted into fifth position. Lap 4 - Even though it was my slowest, this was probably one of my favourite laps of the night. I felt tired but still strong enough to continue pushing hard. I was impressed at the way I had run up until now and had received a big mental boost from knowing that I was still pulling away from my adversaries. On top of this, I had caught up and lapped some of my running buddies from SLGR and Dartford Road Runners, and just being able to exchange a friendly grunt was enough to give me (and hopefully them too) a further boost. I was almost red-lining by this point but kept pushing right through to the end. As you can see from my total time, I achieved my goal to come in under 40 minutes by quite a margin. I'm kicking myself that I couldn't have found a few more seconds (maybe without the strong winds I would have) and got under 39 minutes! Anyway, if someone had asked before the race, I would have been over the moon with a 39.59 finishing time so I will just enjoy the fact that I exceeded my goal by such a large amount. The splits picked up in my GPS data were really good. They were fairly even throughout the whole race, but the second five kilometres are the ones that made me smile the most. I don't think I've ever run a 10k as well paced as this. This was my second fastest 10k to date, but even though the time was twenty-one seconds off my personal best which I ran at the British 10k 2014, I felt that that I ran a much better race this time. Going back to my duel with the other runners, it was a lot of fun (it always is when you come out on top!) and I ended up finishing over 30 seconds in front of the Istead and Ifield runner in P6 and well over a minute in front of the Medway Tri runner in P7. Because it was so dark, I couldn't see any other front runners ahead of me but it turns out that I was only 22 seconds behind the runner in P4 - I had thought he was much further away than that. The official results were online by the time I got home. I finished in P5 for the second month on the trot, but this was a much better performance, knocking 58 seconds off my time from just four weeks earlier. On the night one of my teammates picked up the first prize for the 5k and plenty of others managed to run new personal bests. 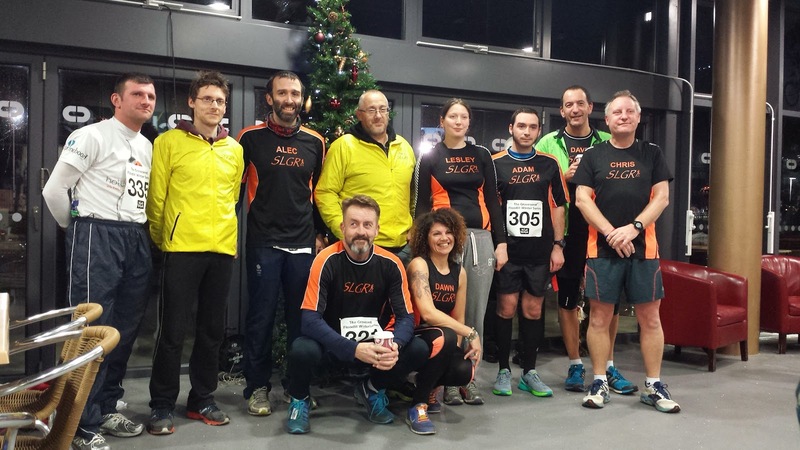 Another good night for #teamslgr at the Cyclopark.